Dr Alex Shigo "Tree Autopsy"
Red Oak , Quercus rubra, 38 years old, with a closed and compartmentalized wound. 1. A star-shaped pith as with most oak species. There is no pith in roots. 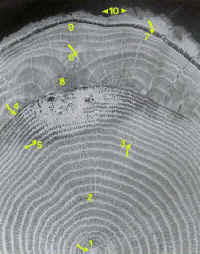 Note the five-lobed growth increments near the center of the tree. 2. Red oak is a ring-porous tree that forms large vessels first in the growing period and smaller vessels later. Wide and narrow rays radiate from the center of the tree. Oaks have a darkly colored protection wood called heartwood. All cells are dead in the heartwood. 3. Some events caused the tree to start decreasing its growth rate at this time. Note the decreasing width of the growth increments. 4. The tree was wounded by buckshot during a dormant period nine years before it was cut. The barrier zone boundary between the growth increments indicates a wound during the dormant period. A wound during the growing period will cause a barrier zone boundary to form within the growth increment. 5. A dark boundary called a reaction zone borders the column of decayed wood in the heartwood. Note that the boundary is darker in color than the heartwood, but as decay develops, the darker wood changes to a lighter color. This is called white rot, because the cellulose and lignin are digested by the fungi. 7. The tree was cut just as the first vessels were forming. Since vessels begin to form as the leaves are expanding, this tree was cut around the second week of May in New Hampshire. 8. The size of the woundwood ribs were very large before the wound was closed. Note that the woundwood ribs contained mostly dense wood with few vessels. 9. After wound closure, the size of the growth increments were about the same as those before the tree was wounded. 10. The pointer to the left shows new bark with a smooth corky layer-phellem. The pointer to the right shows the old original rough phellem of the tree.